Out of all of the casino games available in both land casinos and online, roulette is one of the easiest to pick up and play. Most people will be familiar with the game and how it works, whilst the majority of those that do not know how to play will recognize the wheel and general appearance of the game. So, for those of you that not aware of how roulette is played, here's a quick guide on how to play roulette. The core part of any roulette table is the wheel. The roulette wheel normally consists of 36 numbers from 1 to 36, with each alternating between black and red in colour as you move around the wheel. There will also either be a single green '0' or a green '0' and '00' depending on whether you are playing at a European or American Roulette table. For each game, the wheel is spun and a ball is sent travelling around the edge of the roulette wheel in the opposite direction. After some time, gravity takes hold and both the wheel and ball slow down, allowing the ball to come to rest at a particular point on the wheel. The ball will fall into one of the notches over each number from 1 to 36 or into the green '0' or '00' if available. This result will then determine who the winners of the game are. At the roulette table, you are presented with a number of betting options. The betting area contains a grid filled with number 1 to 36 with an addition '0' and '00' if available, which correspond to the numbers on the roulette wheel itself. 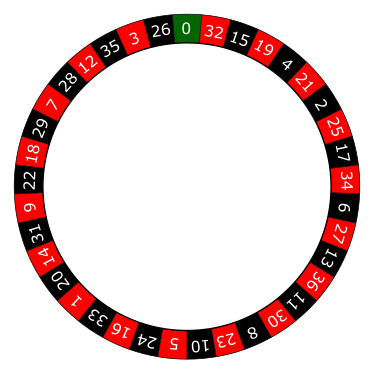 Players can bet on different number within the grid, as well as betting on which colour (red or black) the ball will fall into when the roulette wheel stops. In addition to this, players can spread individual bets over more than one number at a time, so that there are many possible numbers that could result in a win. See the roulette bets and odds article for a more informative description of the different possible bets available at the roulette table. Some bets are of course going to be more likely to win than others, which means that the payout will increase or decrease depending on the chances of a particular bet winning. For example, a bet on one number out of 36 is far less likely to win compared to bet on the colour red, as just under half of the results of each spin will show up as red (don't forget that there is an extra green on the wheel). Therefore the payout for choosing the correct number (35:1) will be much higher than choosing the correct colour (1:1) of each spin. Again, for a more comprehensive list of the payouts for each type of bet, check out the roulette bets article. The odds on a roulette table are displayed in a ratio form, such as 35:1, 17:1, 8:1 and so on. These numbers dictate how much each individual bet will win if they are winning bets. In general, the bigger the odds, the more money you will win if your number (or colour) comes in. For example, with 35:1 odds on a number, you will win 35 times the amount of your bet, on top of the initial bet you made. So if you placed $1 on the number 16 and the roulette ball landed in the number 16 notch on the wheel, you would win $35 on top of you initial $1 bet, returning $36 in total. Similarly, if you wagered $5 instead of $1 and your number came in, the amount you win would still be 35 times the size of the bet, with your initial $5 added on top. Therefore a $5 on one number would return $180 in total. These large wins are what make roulette such an exciting and enjoyable game. Mixed with the fact that roulette is very easy to pick up, you will often find that roulette is one of the most popular games in any casino. So now that you know how to play roulette (from this awesome roulette guide), give it a try at one of the top online roulette casinos on this site!